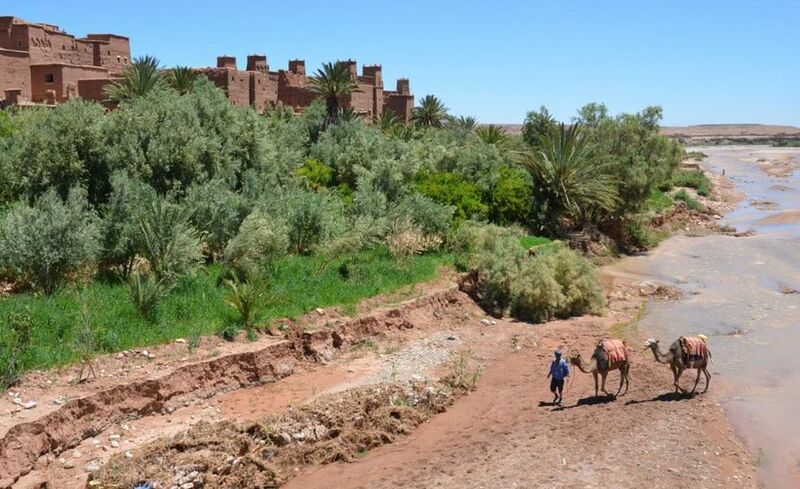 Continue through the most beautiful Kasbah of the "Route of the Kasbah Miles", Passage by Gorges Dades, continuation to the Gorges of the Valley of the Todra through the fascinating palm grove of Skoura, valley of the roses "Kallaat Megouna" Todra or we go to dinner and spend the night. Day 3 : Merzouga - ERRACHIDIA - MIDELT - AZROU - IFRAN - FES. After breakfast, departure towards Fez via Er-Rachidia, Azrou, Ifran ... we cross the middle Atlas of multicolored landscapes where the greenery is more dominant. We will arrive in Fez in the evening where we will dine and spend the night. Day 4 : Visit of FES : FES EL BALI - ADOUA EL ANDALOUS - FES EJDID - BAB BOUJLOUD - FES SOUK. After breakfast we will devote the whole day to the visits of Fez (formerly the spiritual and scientific capital of the Idrissids) founded by Idris I (789) and his son Moulay Idris II (809). 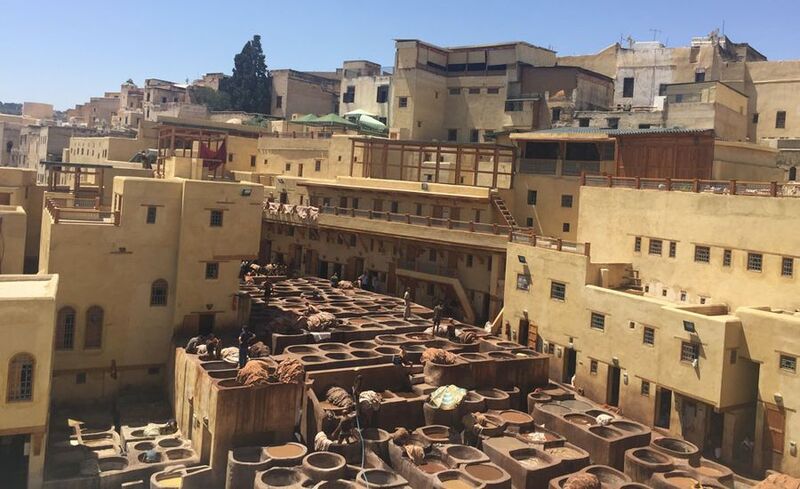 You can visit the medieval medina with its medersa Attarine and Bou Iania, the fountain Nejjarine, the mausoleum Moulay Idriss, the mosque Karaouine, the palace and museum Dar Batha, souks (tannery and ceramics). After lunch. After lunch, we will continue our visit to Fes Jdid (Fez new). Day 5 : FES - VOLIBULIS - MEKNES - CHEFCHAOUEN. 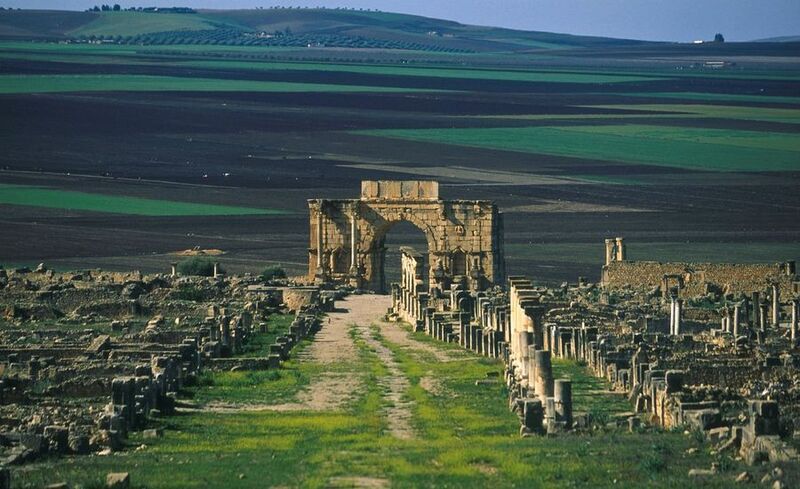 Departure in the morning for Volubilis and the Roman ruins, and afterwards we will continue towards Meknes, stronghold of the Ishmaelites and capital during the reign of Moulay Ismail. Like the other imperial cities, the city of Meknes encompasses a medina surrounded by ramparts: Mansour (Gate) is certainly the most famous gate of the city. After lunch, we will continue our route to arrive in. Late afternoon in Chefchaouen where we will spend the night. Day 6 : CHEFCHAOUEN VISIT AND FREE DAY. 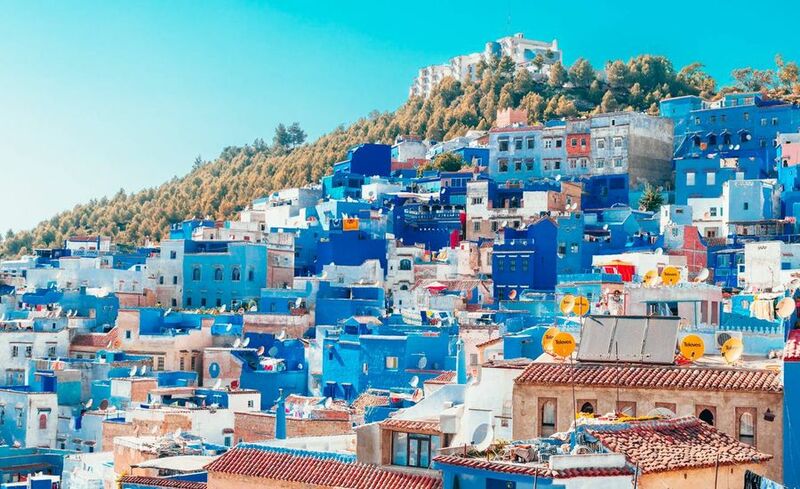 Chefchaouen, known as a holy city and where there are more than twenty mosques or sanctuaries, was for a long time forbidden to Christians even though the Jews were numerous there. Founded in 1471 by Moulay Ali Ben Rachid to serve his attacks against the Portuguese. 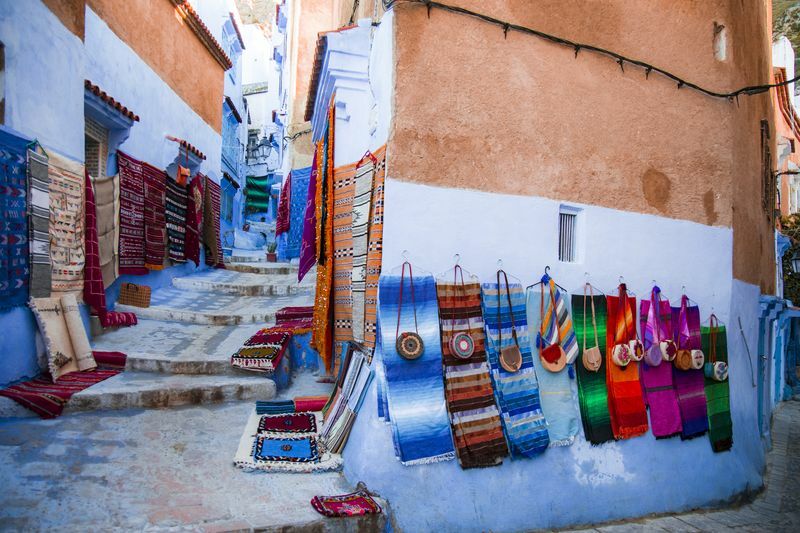 With its tiled roofs, its windows protected by wrought iron grilles, Chefchaouen is the simplicity where one will take pleasure to stroll through the avenue Hassan II, the Place Uta el Hammam, the Kasbah, the Medina ... Dinner and return Instead of accommodation in the evening. Day 7 : CHEFCHAOUEN - RABAT - CASABLANCA. Early departure to Rabat, the administrative capital of the Kingdom, where we will arrive during the day. After lunch, we will discover the Mechouar (ramparts and walls surrounding the Royal Palace), the Kasbah of the Oudayas, not to mention the wonderful mausoleum Mohamed V and the Hassan Tower. After lunch, we will take the road to arrive in Casablanca in the evening. Day 8 : CASABLANCA VISIT AND DEPARTURE FOR MARRAKECH. Casablanca, is the economic capital of the kingdom, we will make a half-day visit and we will discover the Hassan II Mosque, the largest mosque in Morocco and the 2nd highest minaret in the world, Mohammed V square, Habous, Rik's café (or we shot a few sequences of the famous Casablanca film) ... then departure to Marrakech in the late afternoon. Departure for the airport in Casablanca or Marrakech. It is always possible to organize your stay according to your needs and the planned city for your departure. Accommodation in hotels in Todra Gorges, and Touareg tent in the dunes of Merzouga. Highway Payment, Insurance, Gasoil Minibus or comfortable 4x4 has air conditioning. Accommodation and meals in Fez, Chefchaouen, Casablanca.